Today's teachers are preparing students for jobs that may or may not exist. Teaching students the 6 Cs: Communication, Creativity, Critical Thinking, Collaboration, Character Education, and Citizenship are a great foundation for success in any career. Please watch this short video explaing the constant changes taking place in our technological world every second of every day. How can we appropriately prepare our students in a time of such great and constant change? 21st Century Classroom Instructional practices to consider using in the classroom that reinforce the 6 Cs are Project Based Learning and Challenge Based Learning. Both of these practices focus on developing creativity, critical thinking, collaboration, communication, character education, and citizenship. 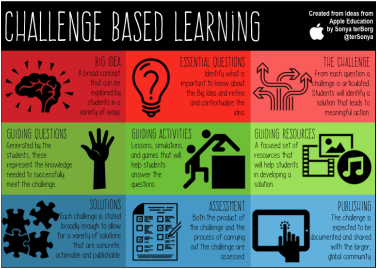 For more information on PBL or CBL, please click on the images.